This little item is called the Tea Bag Squeezer and Cup Cover. As you can see from the demonstration below, it's designed for those fearful of burning mutilating their hands while handling hot tea bags. An epidemic here in the US. God only knows what the Brits are doing about this. I don't know, this just strikes me as something that needs it's own commercial, don't you think? Hi, I'm Cathy Mitchell, here with an amazing new product; the Tea Bag Squeezer and Cup Cover! Now you can enjoy a delicious and healthy cup of tea at any time, without the fear of death or permanent scarring (footage of scar victims crying and drinking coffee instead). 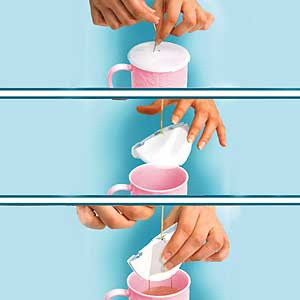 After you pour the scalding hot water into your mug, just place the Tea Bag Squeezer and Cup Cover over the top, leaving the teabag string outside. When you're ready for your hot cup of tea, simply grab the string, lift and fold the durable plastic cover to squeeze the teabag, and you'll get every last drop! You'll protect your hands from severe burns and no one will die! Best of all, it's portable! Put it in your purse when you're out and about and never worry about fear of death by tea again! The Tea Bag Squeezer and Cup Cover comes in white or white and makes a unique and cherished gift for anyone you know who loves tea and hates pain! And it's perfect for wimps and crybabies too! Order now and we'll give you a second Tea Bag Squeezer and Cup Cover absolutely free! Just pay $10.95 shipping and handling.